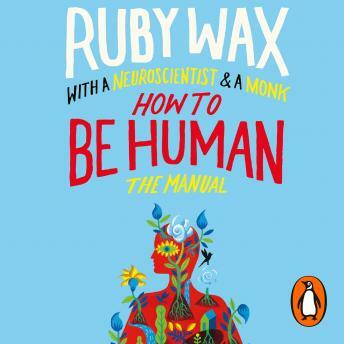 Penguin presents the audiobook edition of How to be Human: The Manual written and read by Ruby Wax with Ash Ranpura and Gelong Thubten. I loved and was really surprised by this book. Surprised as there was so much in it that I wasn't expecting. Insight alongside lots of personal stories that were very moving. Loved loved loved, thank you to Ruby Wax, the Monk and the Neuroscientist. I really liked this book. I got a lot out of it. I also really liked the banter between all three (Ruby, the monk, and the Neuro scientist), the fact they all read their own parts added to it. I'll listen to this book over and over again. The only thing I can't comment on are the exercises at the end of the book. I didn't participate in them. I don't know why I just didn't. Ruby's personality shined through. She was funny, which is always plus. I didn't feel preached to, or lectured at. It was like listening in on a conversation of some wise/smart people. I very much enjoyed listening to this book on tape by Ruby Wax. She presents and inspires in a factual but cheerful, lighthearted, and personal way with a touch of Comedy.